Transportes Cruz del Sur S.A.C. was registered on July 2, 1960. By 1981, the Arequipa-based company had a fleet of 15 vehicles serving routes within the far south of Peru. In 1992, after relocating its headquarters to Lima, Cruz del Sur began a period of rapid expansion. The company developed routes across much of Peru, turning Cruz del Sur from a regional operator into a major nationwide bus service. It services about 74% of Peru. The main office is in Lima. Cruz del Sur serves numerous cities along the north coast of Peru, including Chiclayo, Trujillo, Mancora, Piura, and Tumbes. With the exception of Cajamarca, Cruz del Sur does not penetrate inland from the north coast. If you want to travel to inland cities such as Chachapoyas, Moyobamba, and Tarapoto, you’ll have to find an alternative company (Movil Tours is the best option). To the south of Lima, Cruz del Sur heads along the Pan-American Highway to coastal destinations such as Ica, Nazca, and Tacna. Southern routes also include Arequipa, Puno, and Cusco. Destinations in the central highlands include Huaraz, Huancayo, and Ayacucho. Cruz del Sur is a top-end Peruvian bus company. As such, levels of comfort and standards of service are high in comparison to midrange and budget operators. Depending on the class of bus, you will either have a semi-reclining “bed seat” (semi cama) or a more luxurious VIP “sofa-bed seat” that reclines to 160 degrees (known as full cama or sofa cama). Cruzero Suite: The most luxurious option with VIP seats on both floors and the highest level of onboard service. Cruzero: VIP sofa cama seats on the first floor, with cheaper and slightly less comfortable semi-cama seats on the top floor. Imperial: Semi-cama seats only -- the Imperial is a business class option with no VIP seating. The Cruzero Suite option has a few additional extras, including a free newspaper and a pillow and blanket for the journey. Many bus companies lack adequate security features, increasing the risk of accidents on Peru’s notoriously dangerous roads. 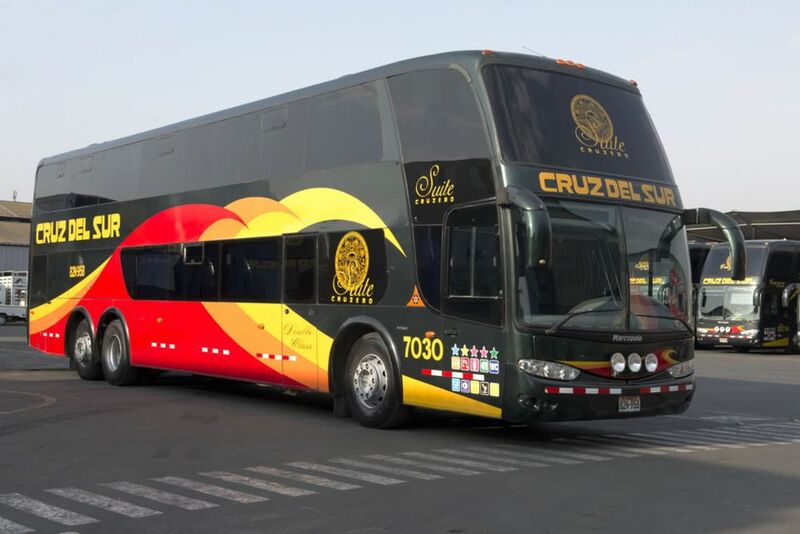 All Cruz del Sur buses have a number of security controls in place, including: use of two drivers (with shift changes every four hours), tachometer-controlled speed limiters, safety belts on all seats, regular maintenance, strict controls to prevent alcohol consumption among crew members, and monitoring of passengers to prevent onboard theft. Despite the company's attention to safety, it does not have a clean accident record. According to bus accident statistics released by Peru’s Ministerio de Transportes y Comunicaciones, Cruz del Sur registered nine accidents between July 1 and December 31, 2010, resulting in two deaths and seven injuries. In the overall bus company rankings for the given period, Cruz del Sur ranked at 31 (with the rankings placing the worst offender at number one). How Will You Get Around in Peru?